In 1940 Jesse Williams discovered some bones at a site in Monument Valley. 2 years later Sam Welles of Berkeley University, while hunting in the area, was taken by Jesse williams to the site where the bones had been found. "There were 3 dinosaurs in a triangle about 20 feet apart" recalls Welles, which were duly excavated and taken back to Berkeley in the space of 10 days. The best skeleton took 3 men 2 years to clean up and prepare. In 1954 Welles published a paper naming it Megalosaurus wetherlii. In 1964 Welles returned to the site of the discovery, and found a 4th skeleton in very good condition, the same as the others but this one also displayed a double crest on its head. Welles proposed a new name for these creatures - Dilophosaurus. On closer inspection the earlier skeleton also displayed a crushed form of this crest. 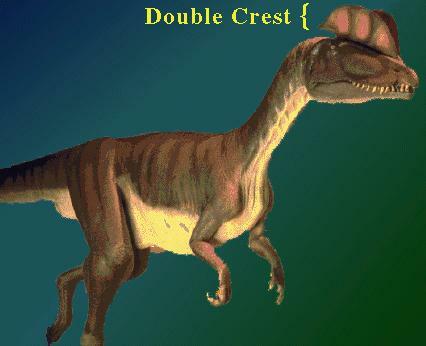 Dilophosaurus was powerful, about 8 feet tall with powerful claws, bipedal, a very rapid runner, and probably gregarious moving in family groups. Dilophosaurus came to the attention of much of the public in Spielberg's 'Jurassic Park'.